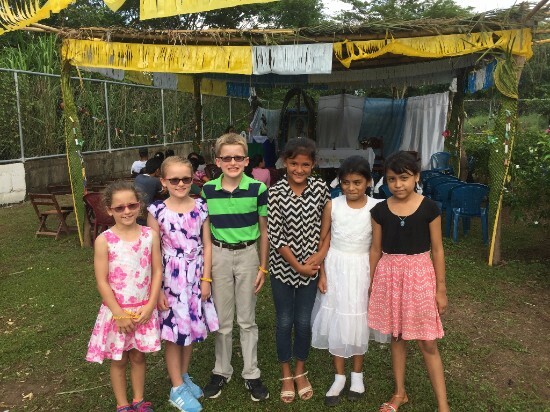 We have learned a lot about generosity through the example of our new friends in Nicaragua. 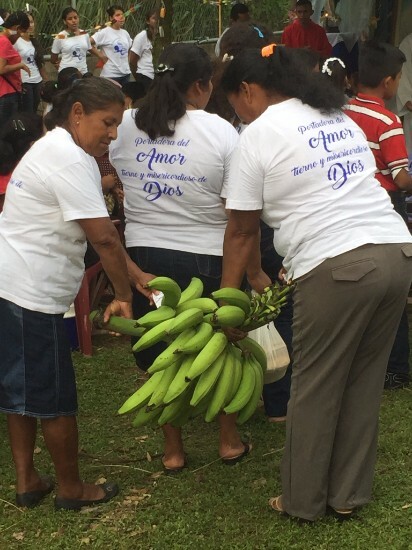 Luke 21:1-4 took on new meaning when we observed two ladies with very little offering the best of their harvest during the Sunday collection, a large load of plantains - a staple of the local diet. A worried, elderly local woman approached me to share that her sister had fallen ill and was bed-ridden. She spoke in rapid, colloquial Spanish which made the exact nature of the illness somewhat of a mystery to my gringa ears. Nonetheless, she took my hand and motioned that we would go visit her sister. Up, up a hill she led me, through the plantain trees of the jungle that cover the lower slope of Mombacho, the volcano on Granada&apos;s south side. As I entered their humble home, I met a most remarkable lady. Lying upon a thin mattress, covered with a mosquito net, she told me she was 88 years old and felt weak. Weak? My ears perked up. Many of my patients back home say they feel weak - I was on some familiar footing now! When I asked how well she could usually get around, she mentioned cooking, tending to chickens, and carrying water up the incline I had just completed from the road below, several times per day. Quite impressive for 88 years old! We visited a while, completed the exam, and came up with a plan for treatment. As I was leaving, the husband motioned for me to wait, and returned a couple of moments later with four lemons from the jungle behind his house. He took my hand and placed the lemons there, saying a word of thanks for coming to see his wife. As I headed back down the hill, my children saw the lemons and wondered, wide-eyed, what had happened up the hill to deserve lemons? “Sometimes people are just glad someone came to visit,” I told them, all the while hoping that if I make 88 years, I will handle illness and challenge with the same grit and grace. Pat continues to enjoy opportunities to serve the spiritual needs of the people. He works in a number of communities and also at a nursing home, getting to know the people, listening to their stories and sharing the gospel message. 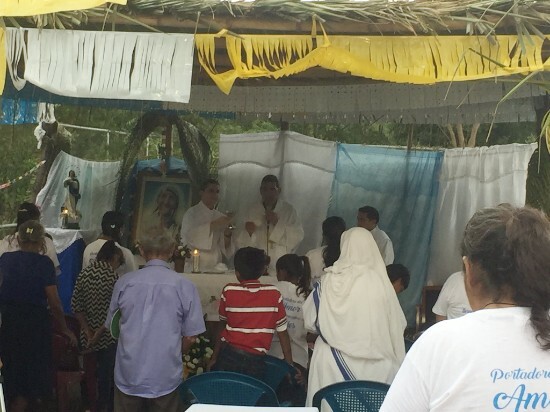 In the photo above, Pat is at an outdoor Mass with Bishop Jorge Solórzano. 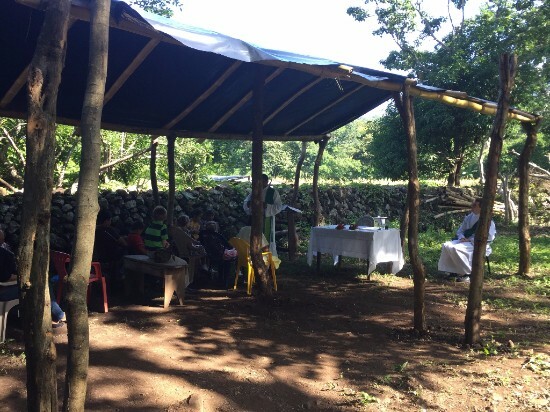 The church was not big enough to accommodate the expected crowds, so the local community constructed an outdoor chapel, and fashioned palm branches into a roof to provide shade. Some aspects of the local culture have taken us by surprise... In the United States, it it not uncommon for a bell to be rung during Mass during the consecration of the gifts. 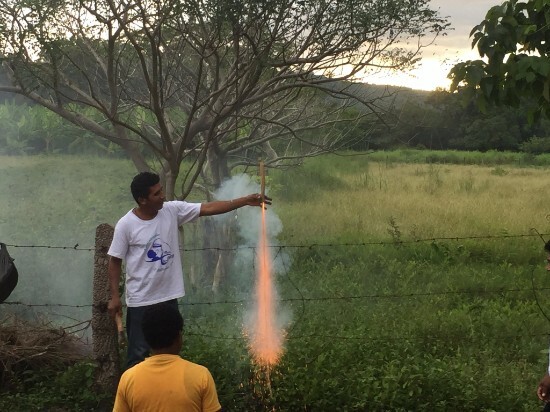 However, in Nicaragua, fireworks are often timed to go off at certain points during the Mass. I wish we could have captured the look on the kids&apos; faces the first time they heard explosions during church! Below, a gentleman sends up a firework during the Sunday celebration. 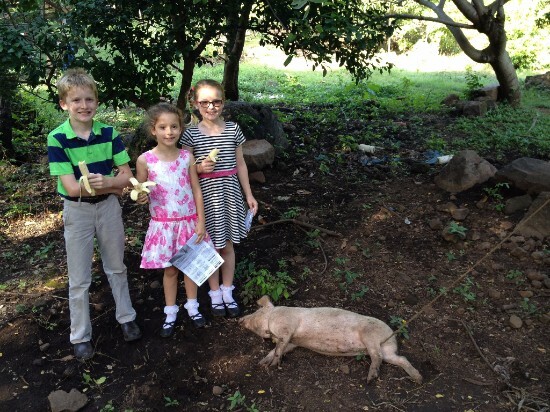 At Las Galeras, Sister Esperanza wanted us to meet the cook from the church and show us how the food was made. We walked down a road leading to the house. It was a dirt road and very bumpy. At the house we saw pigs, chickens, a turkey, and very skinny puppies. 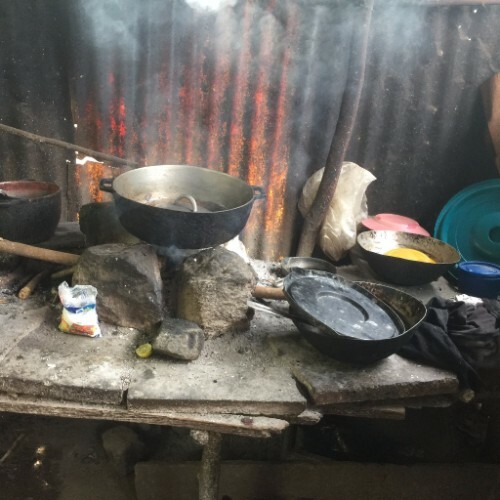 They cook food for people on a wood fire. In the back of the house there were plants growing, I think it was yucca. The family showed us around and was nice to us. The kitchen was small and the floor was dirt. There was no sink. If they need water, they take it from a blue bucket on the floor. In the back, I saw cows. When it was time for dinner, they served us the very best food they had. We ate by candlelight because they didn&apos;t have money for electricity. I thought it was fun, and the food was very good. They were nice to share with us, it made me feel like I was special. 1. Nicaragua will hold national elections on Nov. 6th, two days prior to the U.S. elections. We pray for peace, reconciliation and God&apos;s direction in both cases. 2. Thankgiving to God for continuing to help us move through the bureaucracies of gettting started in a new country. We are able to serve much more effectively with the vehicle now through customs! We also were finally able to open a local bank account and have made progress towards our Nicaraguan residency cards, which included an unannounced home visit from Central Immigration in Managua... a story for another day! All of this has been quite time consuming and a test of patience, but we pray that we have turned the corner! 3. Please pray for the children to continue to thrive. They are doing well and making friends, but have become more homesick with time, missing their friends and family. Thank you for your love, friendship and support.